Located just footsteps away from the long, magnificent, pebble beach of Ixia, this recently renovated resort covers an area of 42.000 square meters. Featuring a private beach, the ultra-all-inclusive Akti Imperial Deluxe Spa Resort & Convention Center is a modern, elegant 5-star historical hotel overlooking the sea, perfect for an unforgettable vacation, in the enchanting setting of Ixia and the Aegean Sea. The resort's prime location is in close proximity of Ixia’s main touristic attractions and only a 5-minute drive from Rhodes Town and the Medieval City of Rhodes (4 km). The hotel has two large swimming pools -the main pool and the “lazy river”, among its beautiful gardens and its palm trees. The main pool near the “Jolly Chef” Center has a length of 42m and a width of 18m. The dimensions of the “snail” shape pool are 21m x 17m. The depth of both pools is approximately 1,45m. The “lazy river” pool has a length of 30m, a depth of 1,45m and runs directly into the main pool. A children’s pool (19.5m x 9.5m x 0.40m) is also available. All pools are fresh water pools. A private underground passage facilitates the access from the main pool area to the beach. Free sun loungers and parasols are available for both pool and beach use. 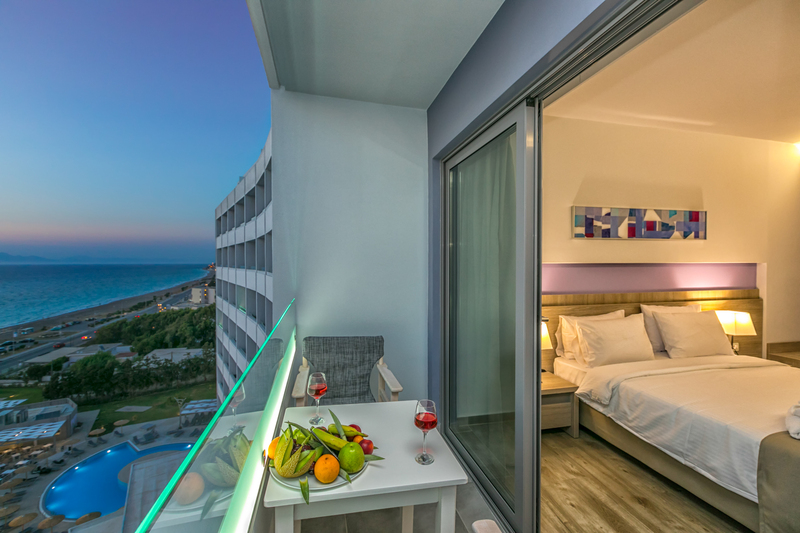 Most of the hotel, approximately 75%, has accommodation either overlooking the sea or with a partial sea view of the beautiful gulf of Ialyssos. This 9-floor impressive hotel boasts 710 guestrooms, of which 630 are Twin rooms, 4 are Junior Suites, 24 are One Bedroom Panoramic Suites, one is a Presidential Suite and 51 are One Bedroom Family Suites in its Annex building. The modern guest rooms at the Akti Imperial Deluxe Spa Resort & Convention Center come with a private bathroom, air-conditioning & heating, direct dial telephone, 43” Plasma TV with satellite channels, high speed WiFi 350 Mbps, mini bar (daily free restocking), safe-deposit box, furnished balcony, bathroom amenities including slippers, full-size hairdryer and scale. Guests can sample various dishes and drinks from the hotel’s main buffet restaurant, four thematic restaurants, express restaurant and pool snack bars. Branded alcoholic or non-alcoholic drinks are offered free of charge at five bars on site. Thematic Restaurants serve tasting menus featuring Seafood, Asian, Greek and Italian cuisines. The hotel provides a wide range of activities. There is daily animation and entertainment teams organizing activities, evening shows and live performances. There are basketball and tennis courts, water aerobics, water polo, billiards, table tennis, darts and more. We offer special activities for children through our hotel's Mini Club and Mini Disco. Room Amenities: All rooms include a mini bar (daily free restocking), free WiFi internet access, 43” Plasma TV with satellite channels, air-conditioning & heating, furnished balcony, bathroom amenities, hairdryer, slippers, direct dial phone, desk, closet, coffee/tea facilities, wake up service, safe-deposit box, scale, towels and linen. 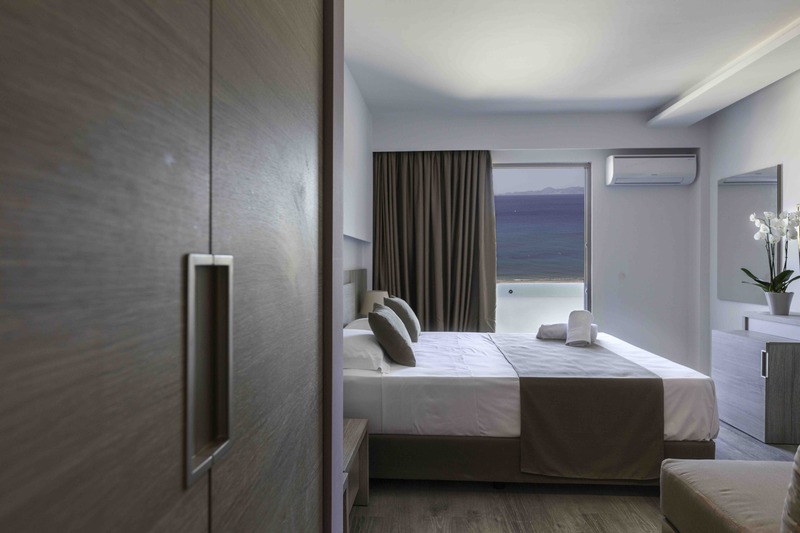 Our Standard Rooms ensure a comfortable stay for up to three guests in a modern and stylish surrounding and are available with three different types of views: Mountain, Side Sea View or Full Sea View. They cover a space of 25 sq. meters and feature a private bathroom (with bathtub or shower) and a private balcony. ‍View: Mountain View, Side Sea View or Sea View. ‍Bedding: Two twin beds or 1 double bed and 1 sofa bed. ‍Location: 1st to 8th floor of Main building. ‍Maximum occupancy: 3 persons (2+1 or 3 adults) + cot. Our Twin Room with Inland View ensures a comfortable stay for up to three guests in a modern and stylish surrounding. They cover a space of 25 sq. meters and feature a private bathroom (with bathtub or shower) and a private balcony. ‍Bedding: Two twin beds and 1 sofa bed. ‍Location: 1st and 2nd floors of Main building. 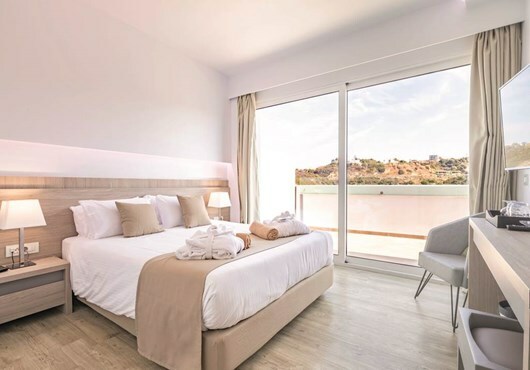 Our One Bedroom Suites ensure a comfortable stay for up to four guests in a modern and stylish surrounding and are available with three different types of views: Mountain, Side Sea View or Full Sea View. They cover a space of 41 sq. meters consisting of a separate bedroom with a double bed, and a separate lounge/sleeping area with two sofa beds. They feature a private bathroom (bathtub or shower) and a private balcony. ‍Bedding: One double bed and 2 sofa beds. ‍Location: 9th floor of the Main building. ‍Maximum occupancy: 4 persons + baby cot (1+3 or 2+2 or 4 adults). 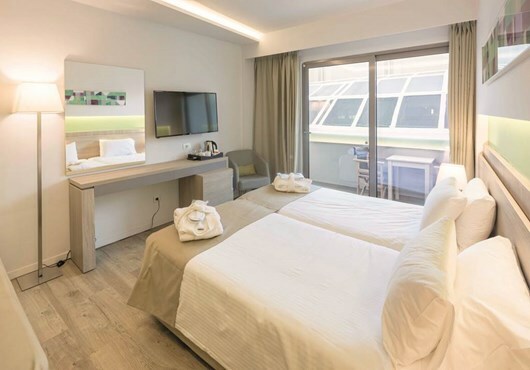 Our One Bedroom Family Suites located in our Annex building, ensure a comfortable stay for up to five guests in a modern and stylish surrounding. They cover a space of 50 sq. meters consisting of a separate bedroom with a double bed, and a separate lounge/sleeping area with up to three sofa beds. They feature a private bathroom with shower and a private balcony. ‍View: Inland View – No View (view over the Conference Center and Parking lot). ‍Bedding: One double bed and up to 3 sofa beds. ‍Location: Annex Building next to the Conference Center. ‍Maximum occupancy: 5 persons + baby cot (1+4 or 2+3). Follow up the standards of junior suites (2 persons). Featuring a private balcony with view over the Aegean Sea, this 32sq. meter open plan suite, consists of one double bed, a private bathroom with bathtub or Jacuzzi and outdoor furnished balcony. Follow up the standards One Bedroom Suites, Stylish & spacious room offers a separate bedroom with double bed& and a combined separate lounge / sleeping area with 2 sofa beds, aprivate bathroom with bathtub or shower furnished balcony, a unit of total size of 41 sq. meters.